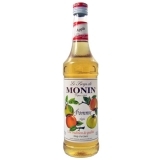 Monin Apple syrup in stylish 70cl glass bottle. Based on the flavour of the sweet red apple, Monin Apple syrup was created to be used in milk-based drinks as it is not acidic and does not make the milk curdle. One of the most popular and widely cultivated fruits in the world, the apple has been a symbol of love, beauty and abundance since ancient times, when 'apple' was the generic term for fruit. It is also depicted as a mystical or 'forbidden' fruit in many religions. 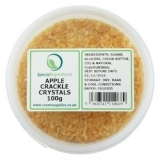 Eaten raw, the apple is a versatile fruit which can also be consumed as juice, apple cider, toffee apples, baked or stewed in desserts, cooked in savoury dishes, or pureed to make apple sauce. Taste: Nose freshly sliced golden apple smell. Attack: sweet and juicy golden apple note. Length in mouth: Fresh acidulated taste. One of my favourite uses is to mix Monin Apple syrup and Caramel sauce in a layered macchiato. As Monin Apple syrup is not acidic you can even steam it with milk. 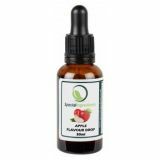 Sugar, water, concentrated apple, green apple & other fruit juice, flavouring, colouring agent: caramel E150a. Total fruit juice: 14% minimum, including 10% apple and green apple juice.